Vocabulary is so important in instruction and the vocabulary of the skills and standards we teach is SO important. 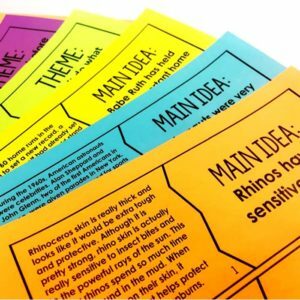 If the students can’t tell you what theme is, they definitely can’t apply that to a story or passage. 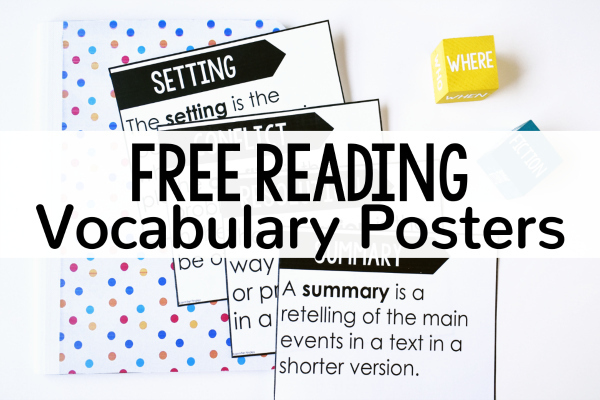 On this post, I will share free reading posters to help you teach the reading vocabulary of the standards and help your students master it. 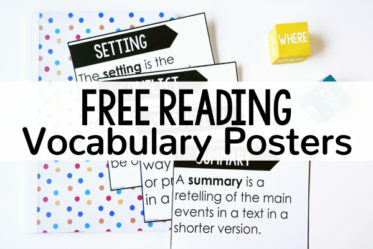 These free reading posters are a perfect way to introduce and review the key vocabulary of the reading standards. By using these posters, you will hopefully no longer hear students ask “What is theme?” while doing test prep (#truestory). 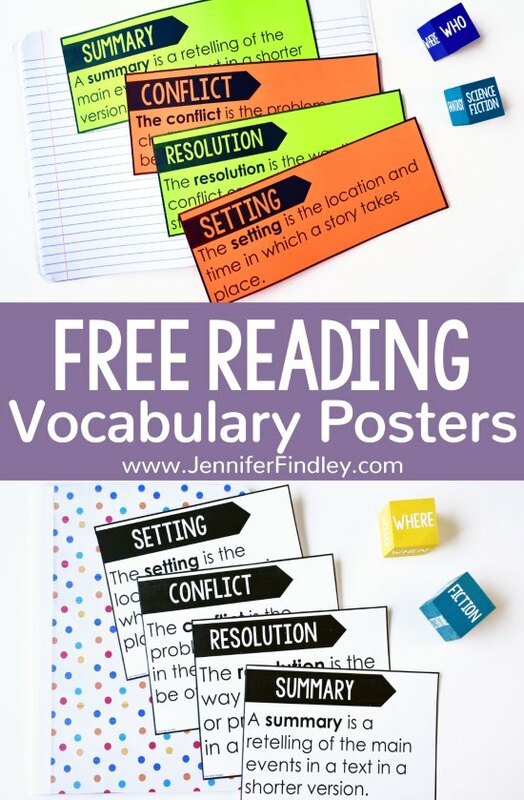 These reading vocabulary chosen for these posters is from the common core reading standards, however, you may easily pick and choose the ones that align with your standards. 1. Hang on the wall as a reference for students. I like to group mine by fiction standards and nonfiction. Hang up a new poster as you introduce the standard to the students. 2. 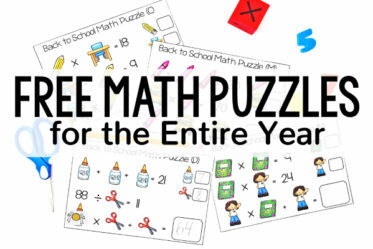 Use on anchor charts. I will be the first to admit that I am terrible with making cute anchor charts. Using these reading posters (by taping them on the chart along with other notes) helps keep my anchor charts organized and useful. 3. 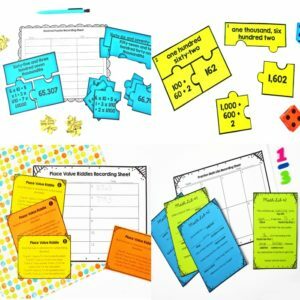 Print/copy multiple reading posters to a page or print at 80% to fit in reading notebooks. 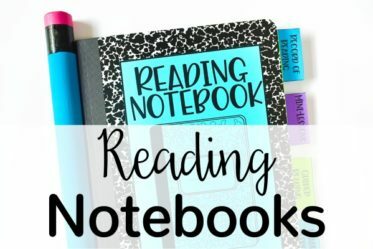 My student have an entire section of our reading notebook devoted to mini-lessons. 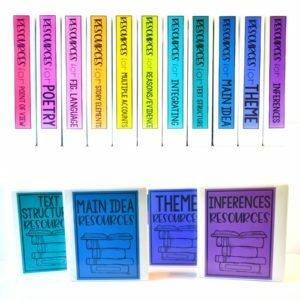 These reading posters would be perfect in that section or even in specific section just for reading vocabulary. 4. Use in guided reading. Each week, I like to have a specific focus for my guided reading groups. 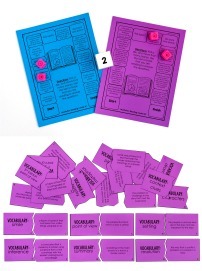 These reading posters are perfect to quickly review the reading term before applying it to our guided reading book. 5. 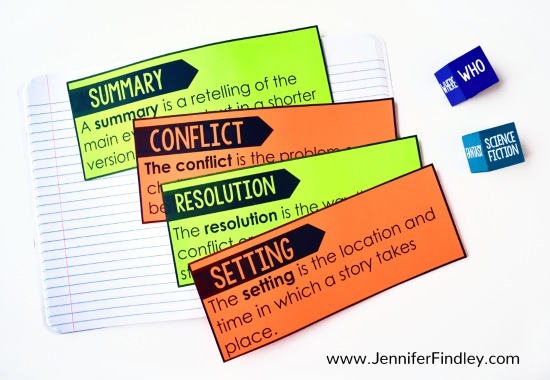 Place in reading centers that focus on that skill as a student reference. Reading centers and stations are a great way to practice previously learned skills. But, sometimes students need a quick refresher of what the reading terms mean. Place these reading posters in a center as a quick review for the students. 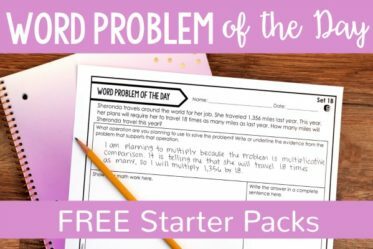 Tell the student you are thinking of a word and give the definition (I like to use a rephrased version of the definition). Have the students use the reading posters to help them give the word. Use a beach ball and throw it to a student. When the student catches it, they must choose a word from the reading posters and give an example or explain it in their own words. Then, they throw it to another student and the “game” continues. Play hangman with the words. However, when a student is ready to guess the word, they must also give a definition in their own words or read the definition from the poster and also give an example. 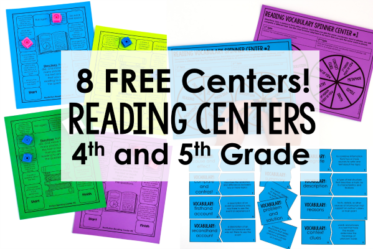 Get the FREE Reading Posters! To get these free reading posters, simply put your email in the box below and they will be sent straight to your inbox. You will find two versions of each poster, a full-size version and a two-to-a page version. Success! 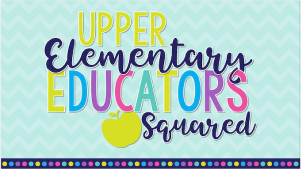 Now check your email to grab your free reading posters! 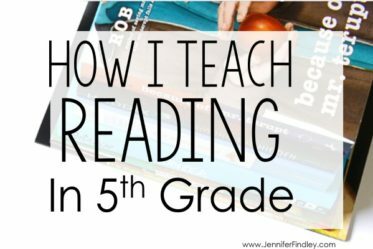 Want to read more tips for teaching reading? 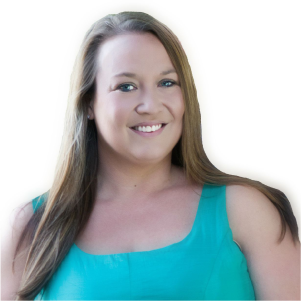 Click on the links below.